The 2016 season is the Minnesota Vikings' 56th in the National Football League and the third under head coach Mike Zimmer. They are defending champions of the NFC North division. The Vikings' new U.S. Bank Stadium in Minneapolis opened this year, with a regular season debut victory on September 18 against division rival Green Bay on NBC Sunday Night Football. It was built on the site of the Hubert H. Humphrey Metrodome, the team's home from 1982 through 2013. The Vikings played at the outdoor TCF Bank Stadium at the University of Minnesota in 2014 and 2015. 1 2 The Vikings traded their third-round selection (86th) to the Miami Dolphins in exchange for Miami's sixth-round selection (186th) and Miami's third- and fourth-round selection in 2017. ↑ San Francisco traded their sixth-round selection (180th) and center Nick Easton to Minnesota in exchange for linebacker Gerald Hodges. 1 2 3 The Vikings traded the sixth-round selection they acquired from the Miami Dolphins (186th) back to the Dolphins in exchange for Miami's sixth-round selection and the seventh-round selection they acquired from the Ravens (196th and 227th). 1 2 3 Philadelphia traded their sixth-round selection (188th) to Minnesota in exchange for the sixth-round selection Minnesota acquired from the Dolphins and their seventh-round selection (196th and 240th). ↑ The Vikings traded their original sixth-round selection (198th) to the San Diego Chargers in exchange for guard Jeremiah Sirles. ↑ Buffalo traded their 2016 sixth-round selection (240th) and a 2015 fifth-round selection (137th) to the Vikings in exchange for quarterback Matt Cassel and Minnesota's 2015 sixth-round selection (187th). The Vikings' preseason opponents and schedule was announced April 7. MIN – Charles Johnson 49-yard pass from Teddy Bridgewater (Blair Walsh kick), 5:43. Vikings 7–0. Drive: 10 plays, 96 yards, 6:39. CIN – Alex Erickson 3-yard pass from AJ McCarron (Mike Nugent kick), 0:47. Tied 7–7. Drive: 5 plays, 54 yards, 1:26. MIN – Blair Walsh 51-yard field goal, 0:00. Vikings 10–7. Drive: 5 plays, 42 yards, 0:47. MIN – C. J. Ham 10-yard run (Blair Walsh kick), 1:44. Vikings 17–7. Drive: 10 plays, 74 yards, 5:46. CIN – Mike Nugent 23-yard field goal, 4:11. Vikings 17–10. Drive: 8 plays, 81 yards, 3:47. CIN – Alex Erickson 80-yard punt return (pass failed), 2:45. Vikings 17–16. MIN – Jerick McKinnon 1-yard run (Shaun Hill–Matt Asiata pass), 2:20. Vikings 8–0. Drive: 8 plays, 77 yards, 4:08. MIN – Blair Walsh 27-yard field goal, 0:00. Vikings 11–0. Drive: 9 plays, 69 yards, 1:09. SEA – Troymaine Pope 4-yard run (Trevone Boykin run), 12:49. Vikings 11–8. Drive: 7 plays, 65 yards, 3:13. SEA – Steven Hauschka 49-yard field goal, 5:46. Tied 11–11. Drive: 13 plays, 58 yards, 5:50. MIN – Marcus Sherels 53-yard interception return (Blair Walsh kick), 1:23. Vikings 18–11. MIN – Blair Walsh 23-yard field goal, 11:04. Vikings 3–0. Drive: 8 plays, 68 yards, 3:56. MIN – Blair Walsh 33-yard field goal, 4:18. Vikings 6–0. Drive: 9 plays, 29 yards, 4:38. SD – Melvin Gordon 39-yard run (Josh Lambo kick), 9:04. Chargers 7–6. Drive: 6 plays, 72 yards, 3:05. SD – Josh Lambo 32-yard field goal, 2:28. Chargers 10–6. Drive: 8 plays, 41 yards, 4:10. MIN – Kyle Rudolph 27-yard pass from Teddy Bridgewater (run failed), 1:18. Vikings 12–10. Drive: 6 plays, 78 yards, 1:10. MIN – Cordarrelle Patterson fumble recovery in the end zone (Shaun Hill–Laquon Treadwell pass), 13:12. Vikings 20–10. Drive: 2 plays, 17 yards, 0:43. MIN – Blair Walsh 23-yard field goal, 6:24. Vikings 23–10. Drive: 9 plays, 33 yards, 4:42. LA – Kenny Britt 1-yard pass from Jared Goff (Greg Zuerlein kick), 11:37. Rams 7–0. Drive: 7 plays, 62 yards, 3:23. MIN – Blair Walsh 30-yard field goal, 2:39. Rams 7–3. Drive: 4 plays, 7 yards, 1:19. MIN – Blair Walsh 34-yard field goal, 0:55. Rams 7–6. Drive: 4 plays, −7 yards, 0:56. MIN – Jhurell Pressley 28-yard pass from Brad Sorensen (Blair Walsh kick), 0:33. Vikings 13–7. Drive: 1 play, 28 yards, 0:09. LA – Greg Zuerlein 35-yard field goal, 4:47. Vikings 13–10. Drive: 13 plays, 59 yards, 7:31. MIN – Jhurell Pressley 106-yard kickoff return (Blair Walsh kick), 4:32. Vikings 20–10. Drive: 0 plays, 0 yards, 0:15. MIN – C. J. Ham 1-yard run (Blair Walsh kick), 11:37. Vikings 27–10. Drive: 3 plays, 6 yards, 1:17. LA – Paul McRoberts 2-yard pass from Sean Mannion (Terrence Magee run), 6:14. Vikings 27–18. Drive: 12 plays, 61 yards, 5:23. LA – Aaron Green 26-yard run (Greg Zuerlein kick), 1:53. Rams 27–25. Drive: 7 plays, 64 yards, 2:02. TEN – Ryan Succop 28-yard field goal, 4:45. Titans 3–0. Drive: 8 plays, 53 yards, 4:24. TEN – DeMarco Murray 6-yard pass from Marcus Mariota (Ryan Succop kick), 0:41. Titans 10–0. Drive: 13 plays, 73 yards, 4:14. MIN – Blair Walsh 50-yard field goal, 13:56. Titans 10–3. Drive: 4 plays, 2 yards, 1:04. MIN – Blair Walsh 33-yard field goal, 5:59. Titans 10–6. Drive: 11 plays, 58 yards, 5:31. MIN – Eric Kendricks 77-yard interception return (kick failed, wide left), 1:24. Vikings 12–10. MIN – Blair Walsh 45-yard field goal, 11:17. Vikings 15–10. Drive: 10 plays, 42 yards, 4:05. 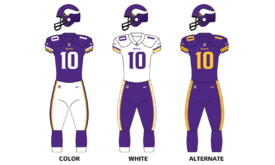 MIN – Danielle Hunter 24-yard fumble return (Blair Walsh kick), 11:03. Vikings 22–10. MIN – Blair Walsh 30-yard field goal, 2:36. Vikings 25–10. Drive: 7 plays, 45 yards, 3:33. TEN – DeMarco Murray 4-yard pass from Marcus Mariota (pass failed), 0:28. Vikings 25–16. Drive: 9 plays, 74 yards, 2:08. GB – Jordy Nelson 1-yard pass from Aaron Rodgers (Mason Crosby kick), 5:39. Packers 7–0. Drive: 5 plays, 52 yards, 3:08. MIN – Kyle Rudolph 8-yard pass from Sam Bradford (Blair Walsh kick), 10:14. Tied 7–7. Drive: 10 plays, 54 yards, 4:46. MIN – Blair Walsh 46-yard field goal, 0:27. Vikings 10–7. Drive: 8 plays, 59 yards, 4:14. MIN – Stefon Diggs 25-yard pass from Sam Bradford (Blair Walsh kick), 2:11. Vikings 17–7. Drive: 6 plays, 87 yards, 2:46. GB – Aaron Rodgers 10-yard run (Mason Crosby kick), 12:41. Vikings 17–14. Drive: 10 plays, 75 yards, 4:30. CAR – Graham Gano 48-yard field goal, 10:52. Panthers 3–0. Drive: 7 plays, 48 yards, 4:08. CAR – Cam Newton 3-yard run (Graham Gano kick), 5:20. Panthers 10–0. Drive: 7 plays, 57 yards, 3:51. MIN – Cam Newton sacked in the end zone by Danielle Hunter for a safety, 1:44. Panthers 10–2. MIN – Marcus Sherels 54-yard punt return (kick failed, wide right), 3:21. Panthers 10–8. MIN – Kyle Rudolph 15-yard pass from Sam Bradford (Jerick McKinnon run), 9:43. Vikings 16–10. Drive: 10 plays, 79 yards, 5:17. MIN – Blair Walsh 28-yard field goal, 13:14. Vikings 19–10. Drive: 7 plays, 33 yards, 2:46. MIN – Blair Walsh 31-yard field goal, 5:07. Vikings 22–10. Drive: 11 plays, 49 yards, 5:55. MIN – Matt Asiata 1-yard run (Blair Walsh kick), 6:28. Vikings 7–0. Drive: 6 plays, 41 yards, 2:42. MIN – Kyle Rudolph 7-yard pass from Sam Bradford (Blair Walsh kick), 7:59. Vikings 14–0. Drive: 9 plays, 65 yards, 4:56. NYG – Josh Brown 40-yard field goal, 0:02. Vikings 14–3. Drive: 11 plays, 44 yards, 2:44. MIN – Blair Walsh 44-yard field goal, 7:39. Vikings 17–3. Drive: 6 plays, 17 yards, 2:16. NYG – Orleans Darkwa 1-yard run (Josh Brown kick), 13:38. Vikings 17–10. Drive: 5 plays, 91 yards, 1:47. MIN – Jerick McKinnon 4-yard run (Blair Walsh kick), 9:20. Vikings 24–10. Drive: 8 plays, 76 yards, 4:18. MIN – Blair Walsh 48-yard field goal, 9:01. Vikings 3–0. Drive: 12 plays, 50 yards, 4:57. PHI – Josh Huff 98-yard kick return (Carson Wentz run), 8:48. Eagles 8–3. Drive: 0 plays, 0 yards, 0:13. PHI – Caleb Sturgis 35-yard field goal, 0:07. Eagles 11–3. Drive: 10 plays, 35 yards, 2:35. PHI – Dorial Green-Beckham 5-yard pass from Carson Wentz (Caleb Sturgis kick), 5:45. Eagles 18–3. Drive: 9 plays, 77 yards, 5:51. PHI – Caleb Sturgis 21-yard field goal, 6:09. Eagles 21–3. Drive: 9 plays, 47 yards, 5:20. MIN – Cordarrelle Patterson 14-yard pass from Sam Bradford (Blair Walsh kick), 0:34. Eagles 21–10. Drive: 11 plays, 56 yards, 3:56. CHI – Connor Barth 30-yard field goal, 8:28. Bears 3–0. Drive: 7 plays, 81 yards, 3:40. CHI – Connor Barth 28-yard field goal, 12:44. Bears 6–0. Drive: 8 plays, 64 yards, 3:33. CHI – Jordan Howard 2-yard run (Connor Barth kick), 7:49. Bears 13–0. Drive: 6 plays, 43 yards, 3:36. MIN – Blair Walsh 30-yard field goal, 0:25. Bears 13–3. Drive: 15 plays, 59 yards, 7:24. CHI – Alshon Jeffery 11-yard pass from Jay Cutler (Connor Barth kick), 9:52. Bears 20–3. Drive: 11 plays, 75 yards, 5:08. MIN – Stefon Diggs 25-yard pass from Sam Bradford (Blair Walsh kick), 5:41. Bears 20–10. Drive: 10 plays, 83 yards, 3:10. DET – Matt Prater 47-yard field goal, 7:14. Lions 3–0. Drive: 9 plays, 57 yards, 5:00. MIN – Blair Walsh 33-yard field goal, 13:20. Tied 3–3. Drive: 12 plays, 61 yards, 4:35. DET – Anquan Boldin 1-yard pass from Matthew Stafford (Matt Prater kick), 0:05. Lions 10–3. Drive: 17 plays, 84 yards, 9:45. MIN – Kyle Rudolph 1-yard pass from Sam Bradford (kick hit right upright), 4:02. Lions 10–9. Drive: 9 plays, 78 yards, 5:33. DET – Matt Prater 53-yard field goal, 12:33. Lions 13–9. Drive: 4 plays, 8 yards, 1:08. MIN – Rhett Ellison 1-yard run (Blair Walsh kick), 0:23. Vikings 16–13. Drive: 13 plays, 79 yards, 3:51. DET – Matt Prater 58-yard field goal, 0:00. Tied 16–16. Drive: 4 plays, 35 yards, 0:23. DET – Golden Tate 28-yard pass from Matthew Stafford, 8:21. Lions 22–16. Drive: 11 plays, 87 yards, 6:39. WAS – Jamison Crowder 4-yard pass from Kirk Cousins (Dustin Hopkins kick), 9:04. Redskins 7–0. Drive: 10 plays, 68 yards, 4:19. WAS – Vernon Davis 38-yard pass from Kirk Cousins (Dustin Hopkins kick), 14:18. Redskins 14–0. Drive: 9 plays, 91 yards, 4:58. MIN – Matt Asiata 1-yard run (Blair Walsh kick), 5:39. Redskins 14–7. Drive: 8 plays, 67 yards, 3:52. MIN – Kyle Rudolph 20-yard pass from Sam Bradford (Blair Walsh kick), 0:58. Tied 14–14. Drive: 7 plays, 75 yards, 2:40. MIN – Adam Thielen 3-yard pass from Sam Bradford (kick wide right), 0:00. Vikings 20–14. Drive: 4 plays, 33 yards, 0:50. WAS – Dustin Hopkins 30-yard field goal, 8:53. Vikings 20–17. Drive: 12 plays, 55 yards, 6:07. WAS – Dustin Hopkins 37-yard field goal, 0:38. Tied 20–20. Drive: 11 plays, 49 yards, 5:16. WAS – Dustin Hopkins 50-yard field goal, 9:33. Redskins 23–20. Drive: 7 plays, 60 yards, 3:21. WAS – Dustin Hopkins 28-yard field goal, 2:31. Redskins 26–20. Drive: 8 plays, 32 yards, 3:13. MIN – Adam Thielen 16-yard pass from Sam Bradford (Kai Forbath kick), 10:25. Vikings 7–0. Drive: 5 plays, 44 yards, 2:54. ARI – David Johnson 1-yard run (Chandler Catanzaro kick), 4:07. Tied 7–7. Drive: 11 plays, 75 yards, 6:18. ARI – Chandler Catanzaro 34-yard field goal, 10:04. Cardinals 10–7. Drive: 12 plays, 78 yards, 6:26. MIN – Matt Asiata 2-yard run (kick blocked), 7:16. Vikings 13–10. Drive: 5 plays, 75 yards, 2:48. MIN – Xavier Rhodes 100-yard interception return (Kai Forbath kick), 3:07. Vikings 20–10. ARI – Jermaine Gresham 29-yard pass from Carson Palmer (Chandler Catanzaro kick), 0:50. Vikings 20–17. Drive: 7 plays, 75 yards, 2:17. MIN – Cordarrelle Patterson 104-yard kickoff return (Kai Forbath kick), 14:47. Vikings 27–17. MIN – Kai Forbath 27-yard field goal, 0:04. Vikings 30–17. Drive: 11 plays, 75 yards, 5:06. ARI – David Johnson 4-yard pass (Chandler Catanzaro kick), 7:24. Vikings 30–24. Drive: 6 plays, 27 yards, 1:46. DET – Anquan Boldin 2-yard pass from Matthew Stafford (Matt Prater kick), 7:14. Lions 7–0. Drive: 12 plays, 75 yards, 7:46. MIN – Matt Asiata 5-yard run (Kai Forbath kick), 0:40. Tied 7–7. Drive: 12 plays, 75 yards, 6:34. DET – Matt Prater 29-yard field goal, 6:45. Lions 10–7. Drive: 6 plays, 59 yards, 3:05. MIN – Kai Forbath 30-yard field goal, 7:03. Tied 10–10. Drive: 5 plays, 49 yards, 2:42. MIN – Kai Forbath 28-yard field goal, 12:38. Vikings 13–10. Drive: 13 plays, 76 yards, 7:36. DET – Matt Prater 48-yard field goal, 1:45. Tied 13–13. Drive: 10 plays, 68 yards, 3:17. DET – Matt Prater 40-yard field goal, 0:00. Lions 16–13. Drive: 2 plays, -2 yards, 0:30. MIN – Kai Forbath 48-yard field goal, 2:28. Vikings 3–0. Drive: 6 plays, 32 yards, 3:17. DAL – Ezekiel Elliott 1-yard run (Dan Bailey kick), 5:29. Cowboys 7–3. Drive: 8 plays, 84 yards, 5:12. MIN – Kai Forbath 36-yard field goal, 2:10. Cowboys 7–6. Drive: 10 plays, 49 yards, 4:52. MIN – Kai Forbath 33-yard field goal, 14:11. Vikings 9–7. Drive: 4 plays, 4 yards, 0:56. DAL – Dez Bryant 8-yard pass from Dak Prescott (Dan Bailey kick), 10:22. Cowboys 14–9. Drive: 1 play, 8 yards, 0:06. DAL – Dan Bailey 39-yard field goal, 4:15. Cowboys 17–9. Drive: 5 plays, 33 yards, 2:22. MIN – Jerick McKinnon 3-yard pass from Sam Bradford (pass failed), 0:25. Cowboys 17–15. Drive: 8 plays, 65 yards, 1:44. Head Coach Mike Zimmer missed this game after undergoing emergency eye surgery the night before. Special teams coordinator Mike Priefer served as interim coach for the game. Source: Minnesota Vikings' official website. ↑ "2016 NFL Draft Tracker - Minnesota Vikings". NFL.com. National Football League. Retrieved May 1, 2016. ↑ Boilard, Kevin (May 13, 2016). "Report: Laquon Treadwell's contract worth nearly $10 million". 247Sports. Retrieved May 16, 2016. ↑ Tomasson, Chris (April 29, 2016). "Vikings trade out of third round, getting three picks from Miami". TwinCities.com. Retrieved April 29, 2016. ↑ Alper, Josh (October 6, 2015). "Vikings trade Gerald Hodges to 49ers for Nick Easton and a pick". NBCSports.com. Retrieved October 6, 2015. ↑ Nogle, Kevin (April 30, 2016). "Miami Dolphins pick Jakeem Grant in sixth round". SBNation. Retrieved April 30, 2016. ↑ "Vikings trade up in 6th round, select TE Morgan out of Texas-San Antonio". Fox Sports. April 30, 2016. Retrieved April 30, 2016. ↑ Alper, Josh (September 5, 2015). "Chargers trade Jeremiah Sirles to Vikings as they hit 53 players". ProFootballTalk. NBC Sports. Retrieved September 5, 2015. ↑ Smith, Michael David (March 4, 2015). "Bills acquire Matt Cassel in trade with Vikings". NBC Sports. Retrieved March 4, 2015. ↑ Florio, Mike (March 5, 2016). "Vikings re-sign Andrew Sendejo". Pro Football Talk. NBC Sports. Retrieved March 8, 2016. ↑ "Adam Thielen Contract, Salary Cap Details & Breakdowns". Spotrac. Retrieved May 1, 2016. ↑ Tomasson, Chris (March 8, 2016). "Vikings linebacker Audie Cole signs new deal". TwinCities.com. Digital First Media. Retrieved March 10, 2016. 1 2 3 4 Tomasson, Chris (March 9, 2016). "Vikings have deals with offensive linemen Alex Boone, Mike Harris". TwinCities.com. Digital First Media. Retrieved March 10, 2016. 1 2 3 "Vikings re-sign Sherels, Ellison, Newman". FoxSports.com. Associated Press. March 15, 2016. Retrieved March 15, 2016. ↑ "Matt Asiata Contract, Salary Cap Details & Breakdowns". Spotrac. Retrieved May 1, 2016. ↑ "Justin Trattou Contract, Salary Cap Details & Breakdowns". Spotrac. Retrieved April 1, 2016. ↑ "Chad Greenway Contract, Salary Cap Details & Breakdowns". Spotrac. Retrieved May 1, 2016. ↑ Alper, Josh (April 18, 2016). "Zach Line remains with Vikings". ProFootballTalk. NBC Sports. Retrieved April 18, 2016. ↑ "Vikings Sign Joe Berger to a 1-Year Extension". Minnesota Vikings Football. Retrieved September 9, 2016. 1 2 "Vikings Release Mike Wallace, Waive Austin Wentworth". Vikings.com. Minnesota Vikings Football. March 8, 2016. Retrieved March 8, 2016. ↑ Tomasson, Chris (March 13, 2016). "Guard Austin Wentworth says NFL career over after one Vikings season after suffering leg clots and losing muscle". TwinCities.com. Pioneer Press. Retrieved March 15, 2016. ↑ "Vikings Announce Roster Moves". Vikings.com. Minnesota Vikings. August 30, 2016. Retrieved August 30, 2016. ↑ "Vikings Release John Sullivan, Announce Other Roster Moves". Vikings.com. Minnesota Vikings. August 30, 2016. Retrieved August 30, 2016. ↑ "Transactions roundup: Vikings to add guard Alex Boone". nfl.com. National Football League. March 9, 2016. Retrieved March 9, 2016. ↑ "Ben Goessling on Twitter". Twitter. March 17, 2016. Retrieved March 17, 2016. ↑ "Vikings Acquire QB Sam Bradford". vikings.com. Minnesota Vikings Football. September 3, 2016. Retrieved September 3, 2016. ↑ "Vikings Sign 9 Players To Practice Squad". vikings.com. Minnesota Vikings Football. September 4, 2016. Retrieved September 4, 2016. ↑ "Minnesota Vikings Sign Shamiel Gary To Practice Squad". dailynorseman.com. Daily Norseman. September 4, 2016. Retrieved September 4, 2016. ↑ "Carter Bykowski Contract, Salary Cap Details & Breakdowns". Spotrac. Retrieved May 1, 2016. ↑ "Kenrick Ellis Contract, Salary Cap Details & Breakdowns". Spotrac. Retrieved May 1, 2016. ↑ Goessling, Ben (March 18, 2016). "Vikings sign Brian Leonhardt to one-year deal". ESPN. ESPN Internet Ventures. Retrieved March 20, 2016. ↑ Gates, Christopher (May 1, 2016). "2016 NFL Draft: Minnesota Vikings Undrafted Free Agent Tracker". DailyNorseman.com. SB Nation. Retrieved May 1, 2016. 1 2 Peters, Craig (May 9, 2016). "Former Gopher Stoudermire Joins Vikings; QB Roberson Going to DB". vikings.com. Minnesota Vikings Football. Retrieved May 10, 2016. 1 2 Peters, Craig (July 27, 2016). "Vikings Add to Offensive Line, Linebacker Groups". vikings.com. Minnesota Vikings Football. Retrieved July 27, 2016. ↑ Vensel, Matt (July 30, 2016). "Vikings sign DT Claudell Louis". StarTribune. Retrieved July 30, 2016. 1 2 Tomasson, Chris (August 20, 2016). "Vikings sign Brad Sorensen for depth at quarterback". TwinCities.com. Digital First Media. Retrieved August 20, 2016. ↑ "Vikings Place Bridgewater on IR, Announce Other Roster Moves". vikings.com. Minnesota Vikings Football. August 31, 2016. Retrieved August 31, 2016. ↑ "Minnesota Vikings Team Statistics". Minnesota Vikings. December 2, 2016. Retrieved December 2, 2016.